On that fajr time, my first and second son opened the door to go to masjid for fajr salah. Suddenly my one-year-old son cried. He wanted to go with his brothers. I refused his wish, worrying he might be bothering other people by his cries or screams. But, my husband suggested me to bring him. 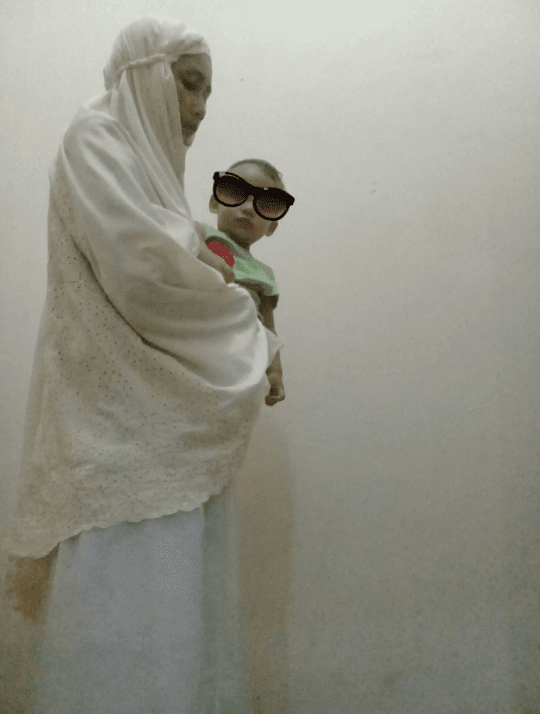 So I walked to masjid with my son in my arms. I entered the masjid, standing behind some ladies doing their qabliyah fajr salah, waiting for the iqamah. I chose the second row which was the last row of the ladies' area. I still held my son in my arms and he seemed to enjoy the moment. The salah began. I was lucky there was only a lady at the left meaning that I wasn't in the middle of the row. I was afraid that my son would cry or something because he often did that everytime I do salah at home. I don't know why he behaves like that. Is this mukena (salah cloth) frightenes him? Or is it my flat expression during salah makes him scary? It was time to do ruku. I let my son free from my left arm. He stood and started to walk forward. He was looking for his big brothers. "Oh, no," I said to myself voicelessly. "Please, help me, ya Allah." I'tidal time and he still stood up between 2 ladies in front of me. I really hoped my son would walked toward me. Sujud time and I felt somebody next to me. My son! Thank God, he didn't continue walking. As the second rakaah came, I embraced him again in my arm. And alhamdulillah, he just stood up next to me while I was doing ruku and sujud until salam. It was a success, I guess. Some ladies turned to me after salah and they greeted me. No angry expressions on their face, alhamdulillah. So my son was welcomed. I think it was a good start. 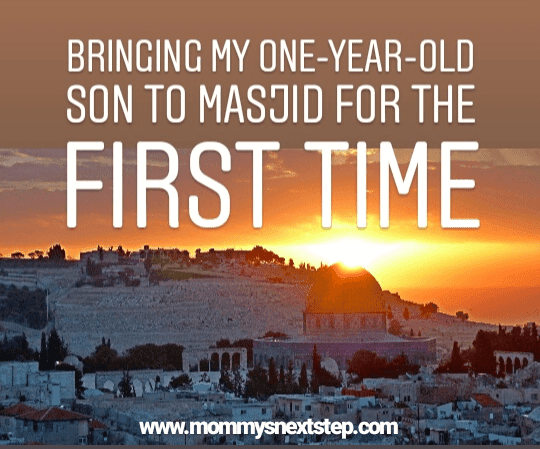 For me, I feel I'm comfortable enough to bring my one-year-old son to masjid. For my son, he can learn something from it. For the community, the presence of young children is a good sign for they have next generation to come to merry the masjid. 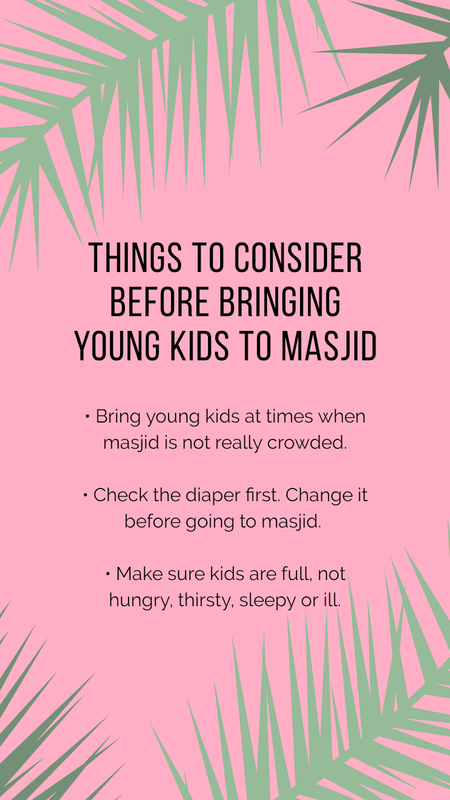 When Is the Right Time to Bring Young Kids to Masjid for Salah? Still, I'm considering to bring babies or toddlers to masjid are tough. Saluté for those who can do it at their kids' early ages. To minimize my worriness, I choose to bring my young kids at times when masjid is not really crowded. Duhur and asar time are great. Not many people come to our local masjid to pray. Maghrib time is really not recommemded as it is peak time at masjid. Many people come to pray as they get home from work. Isya time is bedtime for my son, so I don't think I would bring him for isya salah. What about fajr time? 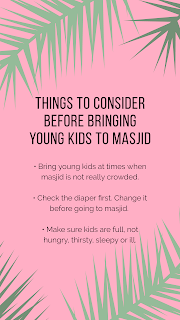 Is it alright to bring younger kids to masjid? It depends on the sleeping and waking up habit of the kid itself. For my son, he usually gets up at fajr time or before it. So, it's possible to bring him to masjid. Don't forget to check the diaper first. Change it before going to masjid. Also make sure kids are full, not hungry nor thirsty. That's what keep them easy to handle. That first experience was a good lesson. 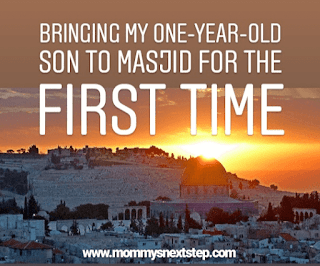 Bringing one-year-old son to masjid is not that bad although it wasn't easy. What about you? Did you have the similar experience too? Kalau ga tenang lebih baik jangan dulu. Anak bisa merasakan soalnya. Now he imitates me, too alhamdulillah.